vegan sandwich wins coral tree cafe ‘panini-off’! UPDATE 5/21/10: sadly, coral tree cafe no longer offers the winning vegan panini. 🙁 chef chloe is still taking los angeles by storm though, so check out her website for updates! 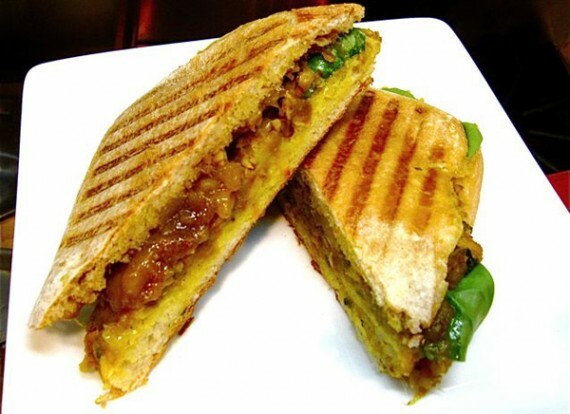 Chloe's Mango Masala Panini: spiced chickpea masala, roasted cauliflower curry, tamarind mango chutney. hey everyone, i’ve got some great news! recently coral tree cafe in brentwood held a contest amongst locals to see who could make the best panini…and while lots of meat-filled sandwiches were entered, it was a vegan panini that won first prize. not just that…but 22 year old chloe coscarelli, the winning chef, actually heard about the contest from my tweet! how awesome, right? !